On Advent: "We Are All Lying in the Mud, but Some of Us Are Looking at the Stars"
The caption at NASA's "Astronomy Picture of the Day" page reads: "Atlantis to Orbit." 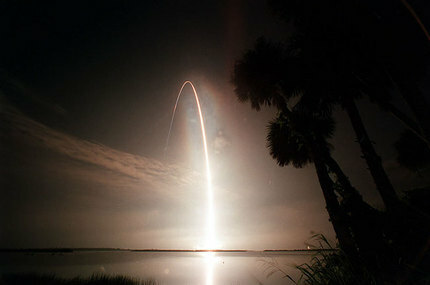 The filename of the picture reads: nightlaunch. And I am moved by the poetry of this most modern of images, not by the triumph of Reason which it seems to enshrine, but by that which is beyond Reason yet within it all the same. In thinking about this brief essay I could not help but think of a longer one by Doctor Bob at The Doctor Is In about a "civilized" European nation that cannot stop itself from taking the next step down into the pit; its people driven, as these things always are, by the inexorable demands of "what is reasonable." 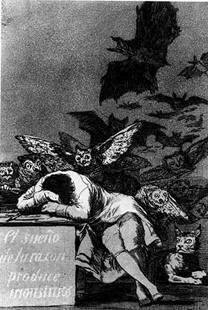 In the work of Goya we see how that great soul came, having walked the carnage cloaked landscapes of his era, to understand that cry of the Enlightenment, "The sleep of reason breeds monsters." Ah well, the Enlightenment lies buried somewhere along the Western Front. It had some nice ideals, but left us living rapt in the spell of Reason. Now we are a "reasonable" society, a "scientific people" swaddled in a million theories of management -- convinced that all can be, somehow, managed through the limitless employment of Reason. Many of us, as we have seen in the past month, worship "intelligence uber alles," that strange and deadly viral god that kills the soul long before it kills the nations that embrace it. We see the apotheosis of this worship leap up from the dazed lands of Europe. We see it arc across our own skies. Reason. Its gifts are many. It enables us to raise "Atlantis to Orbit." The poetry of that is only exceeded by the reality of it; by all that lies behind the sheer raw ability of the smart monkey to organize itself to achieve it -- the mathematics and the metallurgy, the pulses in the silicon chips that hold and control the fire that slices up and beyond the sky. And the systems and wires and waves that bring these thoughts from my fingertips to your eyes now. All these, and whole Alps of others, are the gifts of Reason. But there are darker gifts of Reason revealed by the languor with which a whole people fall "half in love with easeful death." Why? Always because it is "reasonable." Reason commands it and Reason has, in this modern era, become a vengeful and a jealous god. And that, as we now move more deeply into Advent, we move -- in our long sweeping orbit about our home star -- closer to the moments when that which is most deeply our gift and most certainly our curse is made manifest in the music of our being in a manner beyond all reason. And no matter what our faith -- even if that faith is that there is no faith to be had -- this turn of the year, this Advent, will inexorably bring us once again to the memory of the miracle. Our Here. Our Now. Our miracle. Impossible but actual. On this unlikely melding of earth, air, fire and water, fused far ago from starstuff and now circling a single sun swimming in some out-of-the-way arm of a second-class galaxy, where we lift Atlantis into orbit. And while nothing in our Book of Reason can tell us why, its endless banal chapters on irony would need to be excised were we to discover that all our Age of Reason has wrought is but a frail ladder to the stars where we could at last put out our feeble hands "to touch the face of God." For Donald Sensing who put it in my mind, and for Solomonia who pointed me to the picture. Truly beautiful...A Shakespearean soul indeed. The worst mistake a man can make is to misestimate his enemy, to ascribe to him motivations and reasoning he does not ascribe to, much less use. This includes saying that his enemy surely can't mean what he is saying, for no rational man would say such things. On the contrary, the more outrageous your enemy's statements the more likely it is he means what he says. When the tyrant says he will destroy your society is when you take him at his word. Reason can never ascertain that we are saved not by strength and rational thinking, but by acknowledging our most profound weakness and neediness in the darkest, lonliest, most silent night of the Advent Soul. Being at the end of our rope is often a very holy place to be where Real Hope Begins in the humblest of places. Not to proselytize, but this post has much in common with the Pope's latest encyclical, Spe Salvi. You should check it out --it's just 30 pp.-- I think you'd enjoy it. We would have to "slip the surly bonds" of human nature, with its feet of clay, to be truly reasonable. Why do we find toddlers lovable, irresistible? Their radiating love is enrapturing, rupturing the the shells around our hearts. We then blossom too, in smiles, laughter, tears of gratitude. The reason for this is obvious --- and beyond reason.